.... Probably the best-known sentence from the novel is the negation by the pigs of the original slogan that "All Animals Are Equal" by the addition of the afterthought that "Some Animals Are More Equal than Others". As communism in Russia and eastern Europe took on more and more of the appearance of a "new class" system, with grotesque privileges for the ruling elite and a grinding mediocrity of existence for the majority, the moral effect of Orwell's work – so simple to understand and to translate, precisely as he had hoped – became one of the many unquantifiable forces that eroded communism both as a system and as an ideology. Gradually, the same effect spread to Asia. I remember a communist friend of mine telephoning me from China when Deng Xiaoping announced the "reforms" that were to inaugurate what we now know as Chinese capitalism. "The peasants must get rich," the leader of the party announced, "and some will get richer than others." My comrade was calling to say that perhaps Orwell had had a point after all. 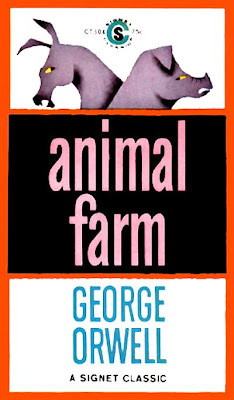 Thus far, Animal Farm has not been legally published in China, Burma or the moral wilderness of North Korea, but one day will see its appearance in all three societies, where it is sure to be greeted with the shock of recognition that it is still capable of inspiring. In Zimbabwe, as the rule of Robert Mugabe's kleptocratic clique became ever more exorbitant, an opposition newspaper took the opportunity to reprint Animal Farm in serial form. It did so without comment, except that one of the accompanying illustrations showed Napoleon the dictator wearing the trademark black horn-rimmed spectacles of Zimbabwe's own leader. The offices of the newspaper were soon afterwards blown up by a weapons-grade bomb, but before too long Zimbabwean children, also, will be able to appreciate the book in its own right. What I like about Hitchens is the quality he shares with Orwell: an unremitting hostility to political oppression.